Suggested Use: 1 or 2 tablets daily with or before breakfast, or as directed by a health care professional. Magnesium is an essential mineral that serves as a cofactor for many enzymes made in the body. Orotate is a raw material that the body uses to make DNA. Because magnesium plays such an indispensable role, magnesium deficiencies can have dire effects. Of the minerals required in large amounts by the human body, the one most likely to be deficient is magnesium.51 In addition, physicians have found magnesium compounds helpful for treating asthma, chronic lung disease, and cardiac conditions such as heart attack and arrhythmias.5 Various disorders have been linked to magnesium deficiencies, including cardiovascular disease, diabetes, high blood pressure, anxiety disorders, dementia, migraines and osteoporosis. 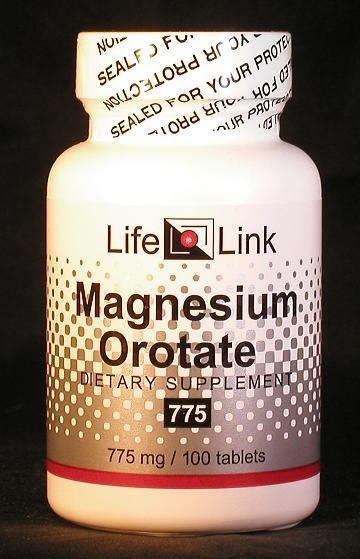 Accordingly, we will limit our discussion of magnesium orotate to a brief summary of relevant research, and let you draw your own conclusions about what medical conditions it may be effective in treating. Other researchers have also studied some of the medical applications of magnesium ororate. Let’s look briefly at these applications. Autism, a neurodevelopmental disorder, is characterized by three behavioral impairments: impaired social interaction, impaired communication, and restricted and repetitive interests and activities.20 According to a recent online survey, approximately 30% of parents give their autistic children a supplement of magnesium and vitamin B6.21 There is no agreement of what dosages of magnesium and vitamin B6 should be used. Are magnesium orotate supplements useful for the conditions and purposes mentioned above? We aren’t allowed to tell you, so you should take a look at some of the references cited here, and then decide for yourself. Assessment of treatment with orotate magnesium in early postoperative period of patients with cardiac insufficiency and coronary artery by-pass grafts (ATOMIC). Rom J Intern Med. 37(3):287-96 (2006) Branea I, et al.